As disclosed during your reservation call and as stated in writing in the Terms and Conditions you agreed to, your resort preview would be between 90-120 minutes. The vacation packages offered by BookVIP are amazingly affordable because the participating resort partner is paying the 70% discount in exchange for your time during the 90-120 minute preview. In addition, we apologize over the inconvenience of the transportation as is the resort – not BookVIP – who arranges the transportation from the airport. That being said, we will be refunding you cost of the transportation. 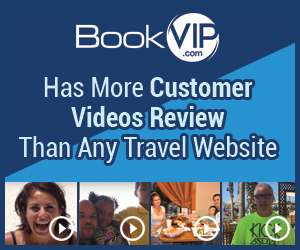 We send over 500,000 people on vacation per year and have more customer video reviews than any other travel site: http://bookvip.com/sitereviews. We booked a vacation to Cancun with Book VIP and were told that we would be picked up at the Airport in Cancun by Super Shuttle and No One had our name at Super shuttle. We were left to find our own transportation to the Hotel. They tell you that the presentation at your hotel will only be 60-90 minutes, but the take you 45 minutes away to another hotel and it ends up being 4 hours. Do not take this deal. Review #1025052 is a subjective opinion of User1025052.